No one told me the downtown library has an annual book sale!!! But I happened to find out the week of the sale so I didn't miss it. I'm sure Chris would have been okay with me missing it. The sale was soooo huge, it took up space on two floors. The normal book sale room (B'ham locals, it's open regularly) was cleared of the usual stuff and filled with children's books! Next year I'll know to schedule twice as much time to go because I didn't even have a chance to look at all of them. 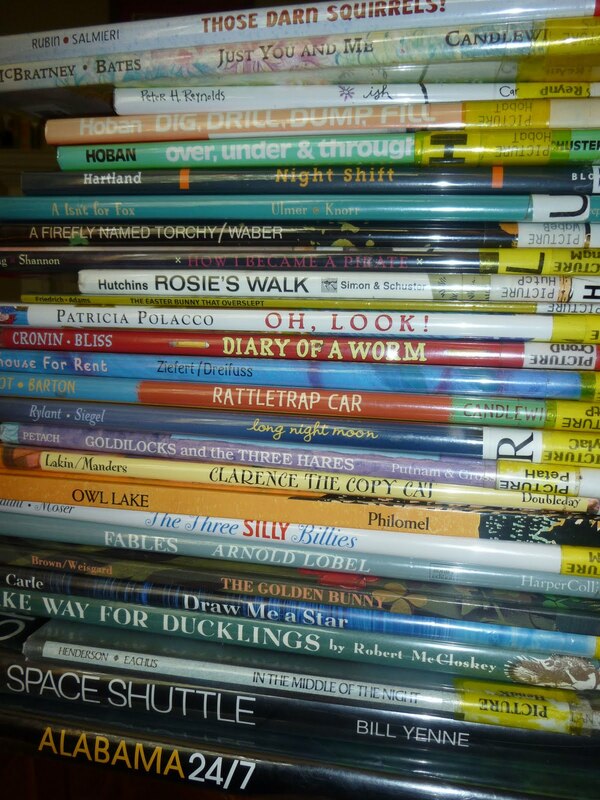 With William getting bigger and all, I brought home lots of picture books. Not one board book. Don't worry, some of the picture books are for Joseph. Huge coffee table book "Space Shuttle" for Chris, copyright 1986. With the space shuttle program ending, I knew he would appreciate it. The classic "Make Way for Ducklings" by Robert McCloskey. "The Golden Bunny" by Margaret Wise Brown for Joseph and his bunnies. Was watching for this on eBay so happy to get it much, much cheaper. Will actually went to the sale with me and probably won't do that again. 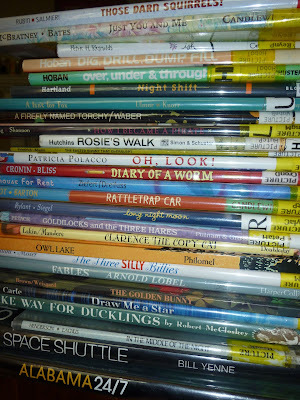 But he was so patient with momma and helped with the book selections. He picked out for himself, "How I Became a Pirate." He recommends it. For me, I got "In the Middle of the Night" by Kathy Henderson/Jennifer Eachus. Because it made me remember all the sleepless nights with Will, but in a good way. My mom wondered why I had gotten it, but she too was tearing up by the end. But you may ask, what did I get for you? 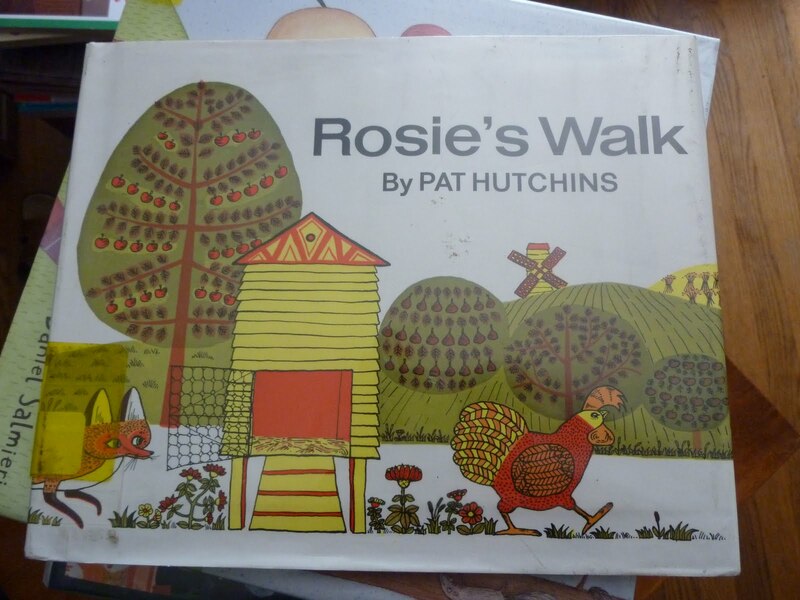 I got you "Rosie's Walk" by Pat Hutchins. A classic with a 1968 copyright,* it is listed in "1001 Children's Books You Should Read Before Growing Up." I got us a copy too, and Joseph made Chris read it to him again and again. Not that he got the joke but that's what makes it appealing to older readers. Leave a comment by next Thursday (June 23) and I'll pick a lucky person at random. Disclaimer: This giveaway is for a USED library book. While in good condition, it looks like a library book. It has the usual library markings. Fair warning and all. *I can't tell you what printing this is but it is definitely not a first edition. what good finds! when you come visit me i will take you to mckays. it is a used bookstore the size of a warehouse with a fab kiddo section! i just went this past weekend with quinn and returned with all sorts of gems.